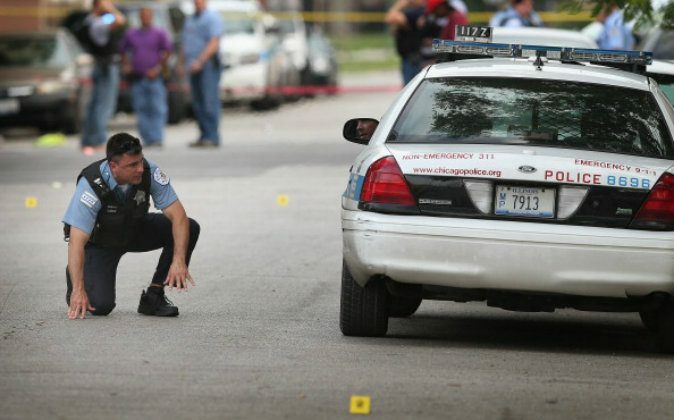 At least 43 people were wounded and nine were killed in shootings across Chicago between Friday evening and early Monday morning, according to local media reports. Among those dead is Arshell Dennis III, the son of a Chicago Police officer. He was shot and killed on the Southwest Side on early Sunday morning, ABC7 reported. He was home from college, where he studied journalism, to visit his sick mother on her birthday. Neighbors said that an armed suspect walked up and opened fire as he was sitting in front of his home, striking him. The latest homicide in Chicago took place on Sunday in the South Side Park Manor neighborhood. At around 9 a.m., a man was found with several gunshot wounds, and was pronounced dead on the scene, police told ABC7. His identity wasn’t released. Earlier on Sunday, a person was found dead in the Austin neighborhood on Chicago’s West Side at around 5:11 a.m., NBC Chicago reported. Two hours earlier, a 31-year-old man was found on the Near West Side with a gunshot wound to the head. He was identified as Alfonso R. Kyles and was taken to a nearby hospital where he was pronounced dead at 3:13 a.m., NBC reported. At around 2:18 a.m., another 31-year-old man identified as Antonie Johnson was found shot dead in a separate attack in the Austin neighborhood, police told NBC. On Saturday at 1 p.m., a 27-year-old, Yanong Woods, was found shot and killed on the East Garfield Park neighborhood on the West Side. A 10-year-old was also wounded in the same attack, according to NBC. A 23-year-old man, Abner Garcia, was fatally shot while driving in the West Eldson neighborhood on the Southwest Side at 1:40 a.m. on Saturday. A van pulled up alongside his car and a person inside flashed gang signs before Garcia and the person argued. Someone in the van then opened the door and shot Garcia. He was taken to Mount Sinai Hospital, where he was pronounced dead, police said. On Friday at 11:35 p.m., a 30-year-old man was shot and killed on the West Side, said police. And a 17-year-old, Johnathan L. Stewart was shot in the chest in a possible drive-by shooting on the South Side. He was pronounced dead at a nearby hospital, NBC reported. His death was the first of the weekend. The latest non-deadly shooting took place at 4:56 a.m. on Monday on the South Side, ABC7 reported.